There are two things all libertarians love: Bitcoin (the greatest thing since sliced bread) and Nikola Tesla (the man who invented sliced bread). While I have nothing against either of them, I think some people can get carried away. Libertarians are a pretty tolerant bunch, but I dare only voice concerns about one sacred cow at time. This time it will be Bitcoin. I think Bitcoin is a fascinating idea, and I love the notion of a decentralized and competitive private currency. But… it’s not money. Here’s why. Does Bitcoin fulfill any of these? No, because the value of Bitcoins is extremely volatile. Any currency that can lose 60% of its value in a day is the very definition of unsound. It is possible to do business in terms of a risky asset–like pesos, Zimbabwe dollars, junk bonds, or dot-com stock–but it’s extremely difficult and poses huge liabilities for any long-term contract. Just imagine trying to adjust your price tags over the course of today’s trading, based not just on the current exchange rate but on what you guess it will be worth tomorrow or next month. Imagine trying to keep your books in order as a business, or trying to figure out if you’ll have even made a profit on your sale by the time the transaction goes through. Imagine issuing 10-year bonds, or 30-year mortgages, or saving for retirement in terms of a currency like that. 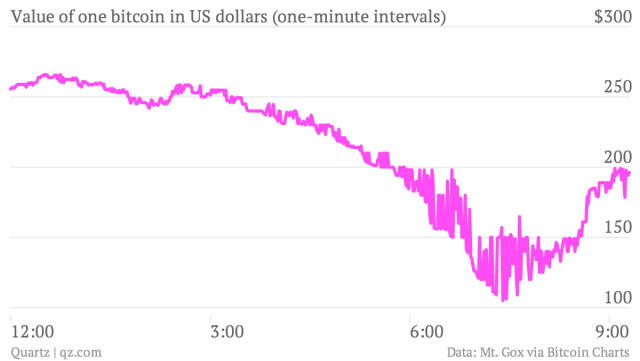 The value of Bitcoin against the dollar, over the course of nine hours. Bitcoin may well be a great speculative investment, and it may even be gaining traction in some online auctions and black markets, but at the moment, it is fundamentally unsound as a currency. Some people have argued to me that you could say the same thing about any new or innovative technology or company. Imagine if you could have invested in Apple in 1980, they say. Well, exactly. It’s speculation based on the hope that its value will rise because more people will want it because they hope its value will rise… and so on. If you can get this kind of perpetual motion machine up and running you might succeed in creating a large, stable money market that facilitates the currency needs of its users. But then again you might be part of Tulip Mania. The difference between investing in Apple in 1978 and Pets.com in 1998 is that one had sound fundamentals and the other didn’t. Does Bitcoin have sound fundamentals as currency? Its defenders argue it does; its detractors argue its too vulnerable. I have no idea, and only time will tell. Right now, it’s speculation. I am not saying Bitcoin can’t work, will never work, is stupid, or shouldn’t be attempted. It’s a novelty, and it can’t be expected to perform like an established currency. I’m aware of this, and I’m not holding it to an unrealistic standard or saying it “ought” to be different. I’m not even saying that you shouldn’t invest in it–people who know what they’re doing make millions spot-trading volatile currencies. I’m only pointing out the reality of the present situation: Bitcoin isn’t money. Not yet. The whole venture is deeply interesting, and I’ll keep watching it. If it becomes as successful as its proponents hope, they will rake in their millions and tell me they told me so. For the moment, though, I’m hedging my bets. A dollar is one of the world’s most liquid assets: it can be turned into virtually anything I want, at least if I put enough of them together. But bitcoins are not so liquid. Mostly, to buy things, I need to trade them for dollars or another currency. And that is the fatal weakness of bitcoins: at some point, to compete with dollars, it needs to enter the real economy. And if bitcoins become a good way to avoid government surveillance of your financial transactions, then governments will find a way to choke off those entry points so that bitcoins become very illiquid indeed. … All of which is to say that the government can destroy much of the value of your bitcoins simply by making it hard to exchange them in the real economy. For bitcoins to be really useful, it must be possible for them to be exchanged for other currencies at a fairly stable exchange rate. For now this is impossible simply because the price of bitcoins gyrates so wildly. But say that things settle down in the bitcoin market; you’ve still got a big problem. Efficiently exchanging them for other currencies implies a physical nexus somewhere: a moneychanger, a central exchange. That physical nexus is vulnerable. Servers or piles of cash can be seized. If the local government turns a blind eye, shipments in and out of that country can be blocked. Update #2: Related to this discussion, William Janeway defends financial speculation and dynamic, bubbly financial markets. At Slate, Eric Posner argues that Bitcoin will fail as a currency because the supply is inherently limited, and if it doesn’t function as currency, it will become worthless. I’m suspicious of this argument for a number of reasons, but it’s worth considering. Update #3: TechCrunch reports that hackers appear to be using DDOS attacks on Bitcoin exchanges to destabilize the market and capitalize on the fall in price. Denial of service attacks and other more sophisticated hacking is a clear technical vulnerability that has to be addressed before Bitcoin can even theoretically serve as a reliable currency.